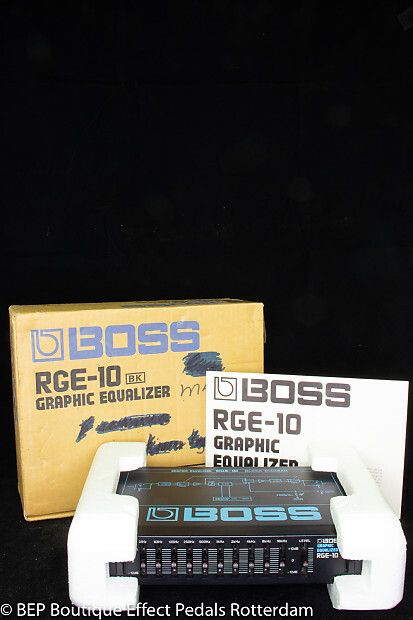 Rare Boss RGE-10 Graphic Equalizer Black Edition- Micro Rack Series, as used by Jeff Hanneman, Kerry King of Slayer in excellent condition with box and manual. If you order more than one pedal, please contact me and I'll make a combined shipping rate. Guitars are shipped to USA mostly by Fedex and will be delivered within 4 days. Our pedals are fully tested on battery power and with an adapter. Before any pedal is shipped we'll make sure that they work 100%. If for any reason your ordered pedal is not working properly then please contact me first, so I'll make sure the correct adapter is used ( Boss ACA vs PSA Adapters for example ).